Everyone knows beer and music go awfully well together. The Flaming Lips are looking to discover just how far down the rabbit hole that sentiment goes. For Record Store Day (April 21), The Flaming Lips are putting out a limited edition 7" vinyl titled "The Story of Yum Yum and Dragon." 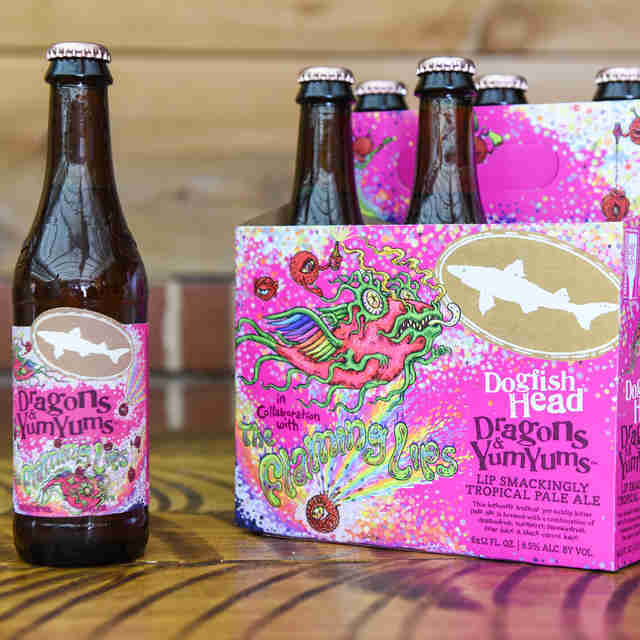 The two songs on the record are inspired by Dogfish Head Brewery's new beer Dragons & YumYums. The tart pale ale gets its name because it's brewed with dragonfruit and yumberries. Those fruits provided Flaming Lips frontman Wayne Coyne with the two characters at the center of the EP, Yum Yum and Dragon. In addition to the two beer-inspired songs, the combination of beer and music gets even stranger. The band will release 100 translucent records filled with the pink Dragons & YumYums beer. Yes, there is actually beer inside the record. This version will be extremely hard to get your hands on. It will only be available at a handful of special events in April. Some of the cities hosting those events include Atlanta, Baltimore, Brooklyn, Key West, Fort Lauderdale, Las Vegas, Nashville, Phoenix, Tempe, and Washington DC. 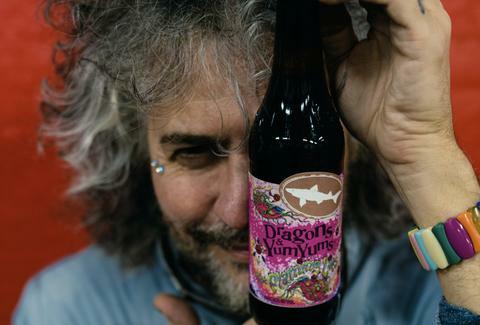 "Turns out they, the Dogfish Head thought we, The Flaming Lips, were a well branded and marketed entity," Coyne said in a statement. "They thought we were perhaps a cult, a cartoon, a religion, a candy company and an Art Rock Group... Us coming together to make, what might be, the world's first vinyl record filled with pink colored beer... is somehow... perfect!" The bottle design by Marq Spusta for Dogfish Head looks perfectly crafted for a collaboration with the band behind the dreamy, psychedelic Yoshimi Battles the Pink Robots. "There’ve been tons of iconic collaborations over the years, but we believe this is the first time a band has been so pivotal and deeply involved in the creation of the beer, the ingredients that were chosen, as well as authoring a song made specifically in tribute of the beer," said Sam Calagione, CEO and founder of Dogfish Head. The band is also issuing re-releases of their first two albums on Restless Records. The first of those, Scratching the Door: The First Recordings of the Flaming Lips, will be released on April 20. The vinyl will be tough to get your hands on, but the beer won't be quite so slippery. It's being rolled out this month and will be available nationwide through August.